The bus moves faster when there’s no one on it. It glides through the city as though on glass. The windows mirror bus seats, the bus driver, and me. I sit in the back, up two steps, tall over the rear wheels. The driver announces the stops, his voice distorting and echoing in the blue, cool, florescent chamber. The bus rolls along and my top-heavy perch tilts side-to-side, swerving around a pothole or catching one dead-on with a shudder. I unzip my worn leather jacket to loosen my itchy-new scarf. The holiday has hollowed the city, everyone's gone to the suburbs for presents by the hearth. Everyone but us orphans. Cabs wander in aimless hoping, searching for a fare, a destination. The streetlights spotlight flakes falling and swirling, a surprise lake effect snow for Christmas. 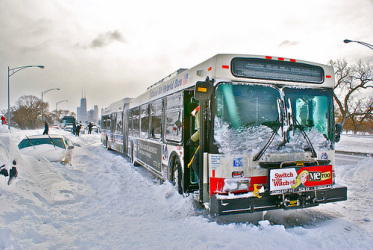 “Next stop, Irving Park,” the driver says. A few riders embark, the shoulders and hood-tops of their bulky red jackets dusted with snow; slush-melt boots stamp off sooty ice which melts in the walkway. We pass under the El tracks and see the coffee-shop owner locking up as a dark shuffling figure passes in virgin snow. “Sheridan, next stop, Sheridan,” says the driver, and we motor forward. “Strattford, Strattford’s next,” he says. The other passengers pull the wire to request the stop. The driver releases the accelerator and we glide, skimming the wet road, slowing to the stop by the big beautiful old Temple. The red coats stumblewalk to the door as momentum pulls free bodies forward; the doors simultaneously open and the coats swing out of the bus like paratroopers over enemy territory. We pull away. The driver drives. Then, a siren, an alarm, a klaxon in the night. The man’s head is smashed into the iron fence that separates the street from the Outer Drive. His head glistens in the light; his mouth gapes. The woman’s pained expression sends lightning deep down to my empty stomach and I see hot tears running down her face. She moves toward the body, its open eyes locked in a frozen gaze. The driver yells to the woman and she does not hear him. He makes a call on his radio, broadcasting to the police or an ambulance or whoever is awake in the snow-blanketed city. "To whom it may concern…" I think to myself. "Anonymous, unknown, without a name. Help." I walk to the front and sit by the driver as he drives away towards Belmont, then Diversey, then further south. “Can you please stop at Roslyn?” I say. "My bar is there. C'mon, I'll buy." “No thank you, mister,” he says.